Brazil's Elano has been ruled out of the World Cup quarter-final against Netherlands with an ankle injury and could miss the rest of the tournament. 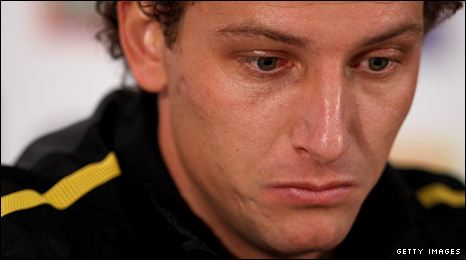 Elano, 29, was hurt during his side's group-stage win over Ivory Coast and limped out of training on Tuesday. Brazil's team doctor Jose Luiz Runco said: "The bone is swollen inside. "He has been undergoing treatment which can take a few days, weeks or a month, there is no timetable. Each day we will make an evaluation." Elano scored in Brazil's opening two World Cup games before being on the receiving end of a crunching tackle from Ivory Coast defender Cheik Tiote in the final group match. The former Manchester City player is angry that Tiote's challenge went unpunished. "I told the referee that he didn't even give a free-kick for a tackle which could have broken my leg," said Elano. "The same player then committed another heavy foul on Robinho for which he should have been sent off. "They have to have another look at this type of violence, because the people who are losing out are the ones who get injured. "In our team, we have players with different characteristics but you never see our players committing a malicious tackle, in contrast to some of our opponents." He added: "I feel sad occasionally but it passes quickly. I'm very optimistic. I've been through a lot of difficult things in my life and this is just another rock on my path." Elano was initially able to train and had hoped to had hoped to play against Chile on Monday, but he missed the match after complaining of further pain, which has continued to trouble him since then. Runco revealed: "He can walk and run without changing direction, the problem is the impact, when he puts weight on it. "The treatment is to avoid impact. He can work in a swimming pool and on the exercise bike. "He is working intensely, so we have to see if nature can give a helping hand." Elano's absence is a blow for the Brazilians, especially as fellow midfielder Ramires is suspended and there are also doubts over the fitness of Felipe Melo and Julio Baptista. Melo is also nursing an ankle problem, while Baptista suffered a knock against Portugal.